All bets are off when The Hangover Part III arrives onto Blu-ray Combo Pack, DVD and Digital Download on October 8 from Warner Bros. Home Entertainment. 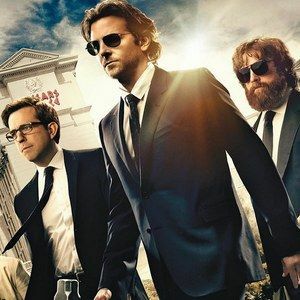 The Hangover Part III follows the infamous Wolfpack as the gang sets out on a fearless mission to save their kidnapped friend in Sin City. From director Todd Phillips (The Hangover, The Hangover Part II, and Old School) and a screenplay by co-writer Craig Mazin, The Hangover Part III stars Bradley Cooper as Phil; Ed Helms as Stu; Zach Galifianakis as Alan; Justin Bartha as Doug; Ken Jeong as Leslie Chow; John Goodman as Marshall; Heather Graham as Jade; and Jeffrey Tambor as Alan's father, Sid. The only member of the Wolfpack who's not content is Alan (Zach Galifianakis). Still lacking a sense of purpose, the group's black sheep has ditched his meds and given in to his natural impulses in a big way - which, for Alan, means no boundaries, no filters and no judgment - until a personal crisis forces him to finally seek the help he needs. UltraViolet allows you to collect, watch and share movies and TV shows in a whole new way. Available with the purchase of specially marked Blu-ray discs, DVDs and Digital Downloads, UltraViolet lets you create a digital collection of movies and TV shows. Services such as Flixster and VUDU allow you to instantly stream and download UltraViolet content across a wide range of devices including computers and compatible tablets, smartphones, game consoles, Internet-connected TVs and Blu-ray players. Restrictions and limitations apply. Go to UltraViolet.Flixster.com for details. For more information on compatible devices go to WB.com/UltraVioletDevices.